The word “affogato,” comes from the Italian word “affogare,” which means “to drown,” and that’s literally what this dessert is: ice cream drowned in a generous splash of dark rich coffee or espresso. And while simplicity is good, we found drowning vanilla ice cream in espresso is just not enough. This version, made with coffee ice cream and a few other flavorful additions, is guaranteed to make family and friends think you’re a dessert genius. And one that would make any Italian proud. It’s pure indulgence. 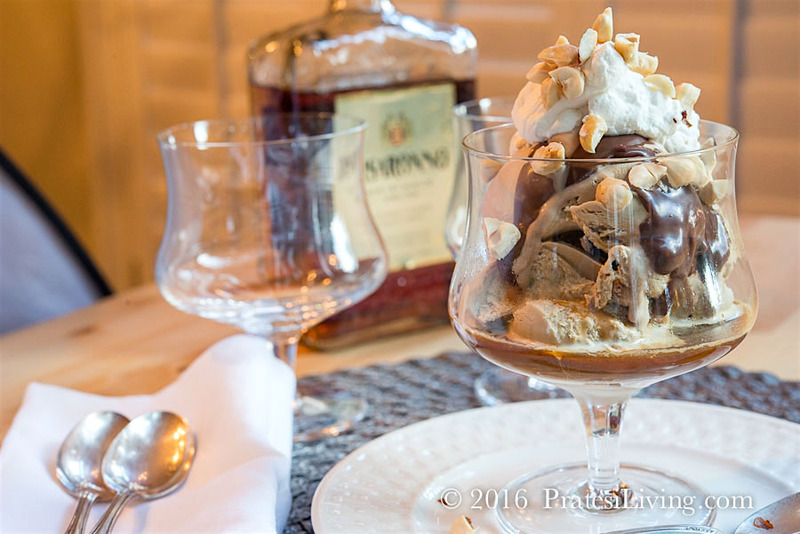 I found this recipe for Affogato while looking for an ice cream dessert for a dinner party many years ago and have been serving it ever since. In search of the perfect finale and a real showstopper, I also needed a recipe made with prepared ice cream and other ingredients that could be assembled ahead of time. This was the perfect find – a dessert and an after dinner coffee and liqueur all in one pretty glass serving dish. 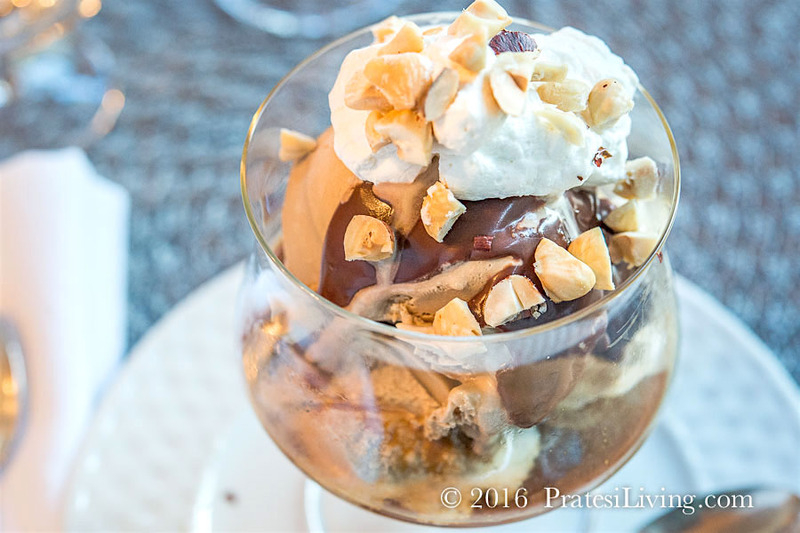 It’s beautiful to serve with the coffee ice cream layered on the bottom and topped with homemade chocolate sauce or ganache, freshly whipped cream (lightly sweetened with powdered sugar and vanilla), and chopped toasted hazelnuts. All of this is “drowned” in Amaretto and espresso, so each bite is a wonderful burst of rich and delicious creaminess with an occasional bit of crunch, taking a simple dessert and making it extraordinary. I use Häagen-Dazs’™ coffee ice cream since it’s high in butterfat and dense and holds up to the liquids better than a lighter or icy ice cream (like Breyer’s). I also prepare the dishes with the scoops of ice cream an hour ahead and return them to the freezer so they are very firm when the liquids are poured over the top. Then there’s the chocolate sauce…Homemade is best, so prepare your favorite chocolate sauce or ganache. I like this recipe from Epicurious since it can be made in advance and reheats well. Use any proportion of ingredients you prefer when it comes to the chocolate sauce, whipped cream, and hazelnuts. With this incredibly decadent combination of flavors, you really can’t go wrong. Easy to prepare, you can assemble all of the ingredients ahead of time and them garnish each serving with the espresso, liqueur, and toppings. The original version of this recipe was created by Chef Cat Cora. For each serving, place 2 to 3 scoops of coffee ice cream in a glass serving dish. If desired, do this about an hour ahead of time and place dishes back in the freezer until right before serving. 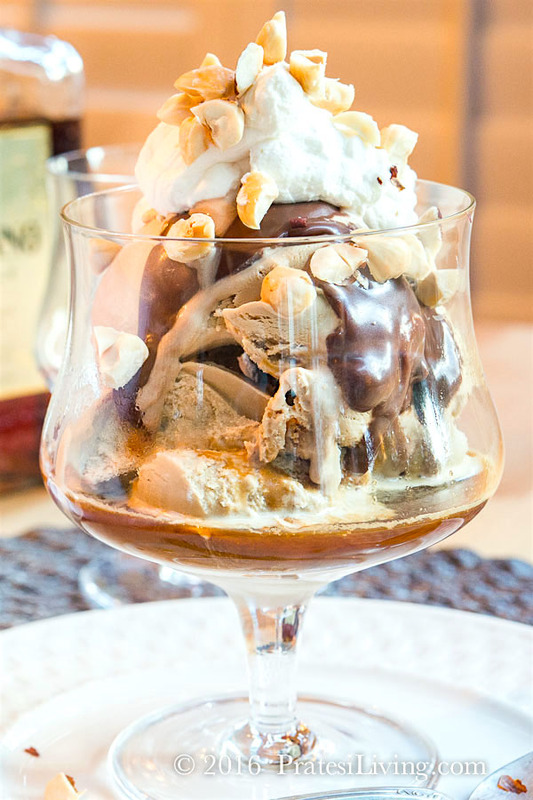 Pour 2 tablespoons each of Amaretto and room temperature prepared espresso over each serving of ice cream. Quickly pour desired amount of chocolate sauce sauce or ganache over the ice cream. Top with a generous dollop of whip cream and sprinkle with chopped hazelnuts.